Amin has always been at our side for the whole duration of our bike adventure, whether riding a bike or driving a car. Amin is a 25-year-old former mountain biker who had to give up biking after an unfortunate accident. After the accident which was followed by the death of his father, to whom he was very attached, he decided to travel to the East to find himself. Amin's father was a famous architect before the revolutions. However, he lost his success after the tumultuous revolt. Despite that, he remained a prominent figure and this was reflected in their home. The house was opulent and the decor is classical but with a hint of personality. From their home, you could tell a lot about their culture and the family's history. 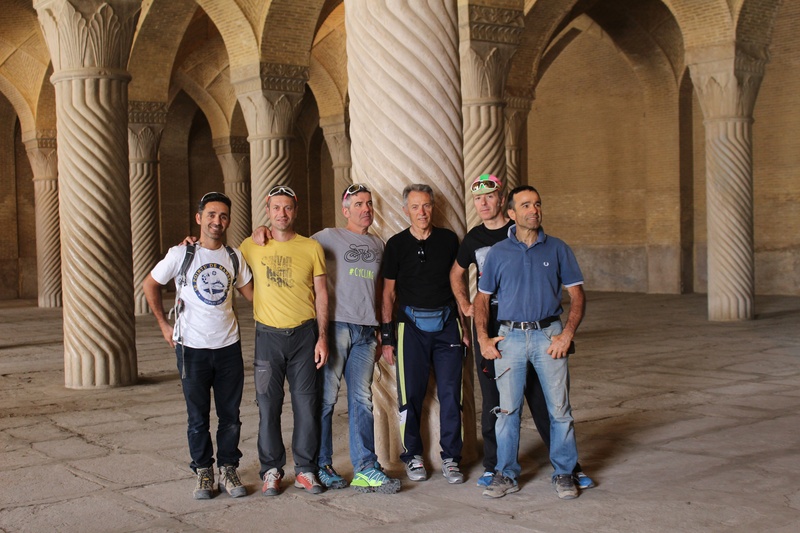 The two days spent in Shiraz allowed us to rest. It was possible to visit the city during our two nights' stay. We thoroughly enjoyed the bazaar and the mosque of Nasir ol Molk. Once again, we managed to absorb the culture of the place and feel the buzz of the population as they went about their daily business. On the afternoon of May 4, we went to admire Persepolis, whose ruins have been part of the UNESCO World Heritage since 1979. We were astonished by the greatness and beauty of what was one of the five capitals of the Achaemenid Empire. Some parts are perfectly preserved, while others have been destroyed over the centuries. We found out about the importance of the city in the past and what was dedicated to the various areas and what was the succession of generations and dynasties who lived in this city. Persepolis was built to last many centuries. However, it was mostly destroyed when Alexander the Great conquered the Achaemenid Empire and to send a message that he was the new ruler of Persia, he burned to the ground the beloved heart of their empire.